Circle K Florida has more than 400 stores spread across Florida that are open 24/7, 365 days a year. They are one of the eight Circle K regions. Circle K Florida offers fast, friendly service, and a quality shopping experience in every one of their stores. Circle K wanted to create the umbrella for a comprehensive summer ice cold beverage program. It will capture the customer’s attention, draw them into the store and continue sales growth. This will make Circle K Florida the number one ice cold beverage destination. 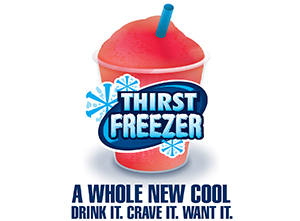 GSP’s Creative and Retail Branding Teams worked to come up with a concept for Circle K’s new frozen fountain drinks. The creative direction was built around the idea of the giant Thirstfreezer image and beautifully designed typography. It markets the idea that this is the “IT DRINK,” the summer drink you want, the drink you crave, the drink you will enjoy.